This month's assignment, Fondue Cowboy brought up all the clichéd images of rawhide, tumbleweeds, and lassoing steer. But what I found at the cozy 40-seat eatery at 1052 Folsom at Russ Street was a more grown-up spaghetti western theme. When I arrived, owner David Mur, and his construction friend Robert Harris were embellishing the bar you'd, ahem, saddle up to with warm multi-toned wooden planks that fill the base of the fondue, beer, and coffee bar. The opposing accent wall will feature cow skulls, Western-themed art, and here's to hoping, The Duke himself on the flat-screen TV! It's hard to picture this Wild West eatery as the site of the former Extreme Pizza production and commissary kitchen. Originally, Dave was dealing with a bright red kitchen twice its size, but negotiated for half the space, and his restaurant began to take shape. (The other half of the space will become an Italian deli that another restaurateur will open up later this year.) Dave's half of the split left him with a dish and prep room, small kitchen, two bathrooms, and a lanky, lengthy dining room filled with light from the Folsom Street-facing window. The initial design vision was made real with architectural plans drawn up by SIA Consulting. Recognizing the new arrivals of condos to the neighborhood, Dave is capitalizing on outdoor seating and intends to roll out a brunch program after a few months of operation. Part of this decision (other than the smart ability to take advantage of more seating) was based on the beautification of adjacent Russ Street, which runs along the side of Fondue Cowboy's space. This beautification was a surprise boon to Dave and his new restaurant since it fell under the umbrella of the Sixth Street Urban Solutions project, working with the San Francisco Redevelopment Agency. Urban Solutions is also offering support to Dave's start-up, with architectural advisement services, façade improvement funds, and tenant information. 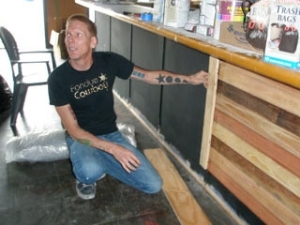 With this newly found help, and Dave's fifteen years in the industry, he felt confident taking on the remodel project. He is not only the owner, and developing the menu concepts with executive chef Brion McDonough, but he's also functioning as project manager on the build-out. All the plumbing, including mop sinks, floor drains, and the grease trap can be fairly expensive endeavors and plumbing sometimes requires costly trenching. And he's finding that his plumbing costs may compare to the installation of his security gate--a surprise cost that Dave never dreamed to bid would rival the other functionalities in the space. One money-saving byproduct of the fondue concept is that David will not need to run gas lines. His chef Brion, with a background in traditional fondue and French cuisine, will get to stretch a bit with a more modern version of fondue using double boilers and convection ovens only. The Fondue Cowboy idea came out of the desire to take traditional fondue and break away, much like westward travelers created their own new outlaws and ways. The kitchen isn't a fully open one, but customers will still get a fun preview of what's coming out in their fondue pots when peeking through the ample kitchen window. Even with all of the support from Urban Solutions and friends in construction, the space Dave is inheriting has some flaws: the kitchen drops down with an uneven floor, requiring a step up. Under the remodel, David can file for an ADA hardship based on the percentage of cost of his build-out in comparison. Other improvements he's making are pouring new cement flooring in the kitchen, installing FRP (fiberglass reinforced plastic) and stainless steel kitchen walls, and planking a wooden bar and wood-paneled walls. There will be warm brown wall paint, bathroom fixture upgrades, he's laying a new tile floor behind the bar, installing pendant lighting and brushed aluminum fans sourced from neighbors at Bay Lighting & Design up the street, and installing a 71-inch flat-screen television showing (what else?) spaghetti westerns. Dave is working toward an early to mid-September opening, pending all inspections happening on time. The liquor license permit application alone has up to three months to review for an inspection. The timeline is coming together as of now, and I'm looking forward to a bite to eat with pals over the fondue pot in this unlikely SOMA outpost.